yay - socks in the plural! When last you saw them, they were not yet a pair. I'm pleased that I started sock#2 again so that the colour bands more or less matched at the top. They mostly keep together, but as I noted previously the colour lengths aren't always the same. I was disappointed that there was a break in the middle of the ball, and that it wasn't even knotted at the right part of the colour progression, but it was easy enough to unwind till I got to a matching bit. You'll know what I mean if you've tried a self-striping yarn! Thanks again to Abakhan who gave me the Aviemore yarn to try. 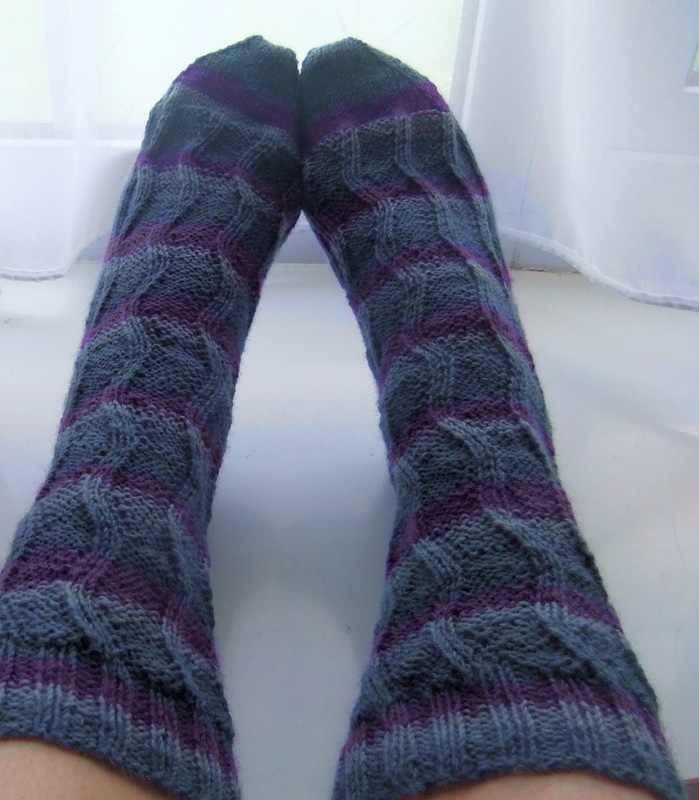 I'm now a real convert to knitting socks on two circular needles so I'm looking forward to my next pair. Guess what everyone will get for Christmas this year? Not these though, these are MINE! your header is so creative, I just love all of your knitted items! Brilliant socks, well done for matching them, I tried a cardigan with self stiping yarn, but of course nothing came out right so I abandoned it.